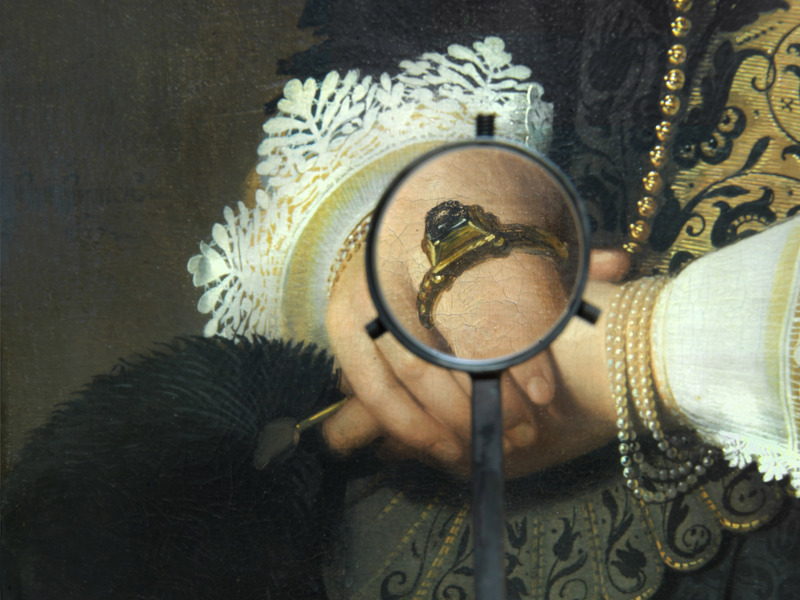 The Frans Hals Museum zooms in on the details, the hidden to the eye and even the invisible! The museum is home to a treasure trove of small things that are usually overlooked but deserve our attention. As in the game I Spy With My Little Eye… visitors are challenged to discover little secrets through others’ eyes. Art critic Wieteke van Zeil, novelist Niña Weijers and the museum’s conservators teach visitors to look in a different way and spin wonderful stories from what they see. At a time when everything has to be big, bigger or biggest in the museum world, the Frans Hals Museum, a museum on a human scale, has chosen to do the opposite. The museum focuses attention on its beautifully worked tiles, ornaments, tiny silver objects and, of course, all those unnoticed details in paintings. Visitors will go on a journey of discovery, like a Gulliver on the island of Lilliput and will be challenged to look at the museum building and the collection with a ‘different eye’. It is a journey for young and old on which visitors will learn to look more closely and develop an eye for the detail, the hidden and the imaginary, and so be given the key to a world of stories. I Spy With My Little Eye… begins with the permanent collection and offers a multi-faceted programme encompassing the entire museum so that visitors can go in search of what is seemingly hidden in a variety of different ways. Spread over the museum’s rooms, visitors will find clues and short stories about details that can be found in paintings, in the interior and on objects. For really keen visitors there is an app with more details in different categories. Wieteke van Zeil, known for her column in the newspaper Volkskrant Je gaat het pas zien als je het doorhebt (You’re only going to see it if you get it), describes details in the paintings she chose from the collection in her own associative way. Niña Weijers recently wrote the universally praised novel De consequenties and now lets visitors enjoy an apparently invisible artwork made especially for the museum. 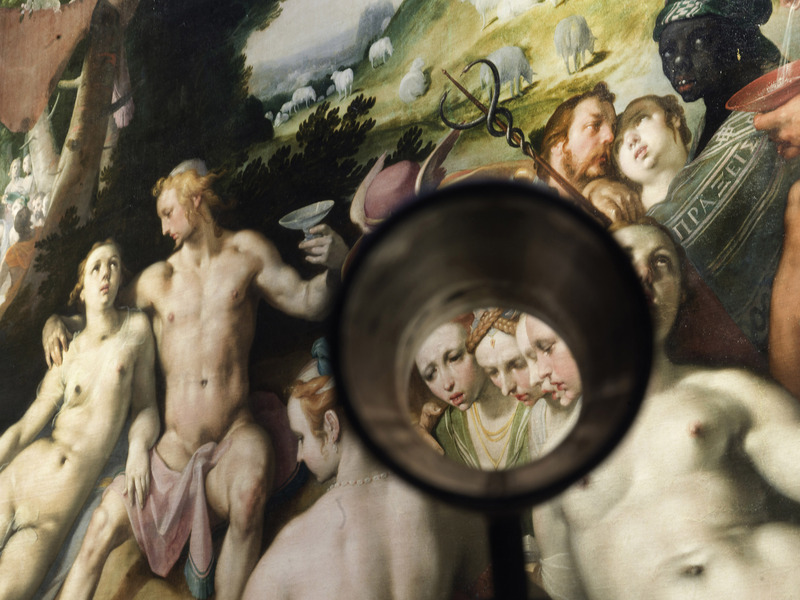 The exhibition Jan van Scorel – A Divine Discovery examines the restoration of The Baptism of Christ,one of Van Scorel’s most important paintings from his Haarlem period.. The exhibition will reveal innumerable details and share the conservators’ discoveries. In Dolls’ House in the Spotlight a world in miniature is opened up to young and old. Inspired by Sara Rothé’s authentic dolls’ house around the corner, it is the perfect way to start focusing on the minutiae. With the permanent collection as the basis, the museum introduces an innovative and multi-faceted approach aimed at broadening visitors’ understanding of art through active involvement. It is important that not everything is immediately visible so visitors have to search for significant details. As in the game I Spy With My Little Eye … it is about discovering what is not immediately obvious at first glance. It is only through the clues, the explanations and the stories that museum visitors will be able to find the hidden treasures. They will be challenged to look closely, to act as ‘researchers’ and to switch from passively ‘seeing’ to actively ‘looking’. Learning to look keenly is a form of visual literacy and can help people derive more pleasure from what they see.